Below is a DRAFT text of the homily. It may vary considerably from the recorded version. Please excuse typos and grammatical errors, and do not cite without permission. Words that have inspired (and terrified) people for millennia. With two thousand years of Christian missionizing in our history…and so much of it bound up with—and inextricably linked to—far too many forms of western imperialism…this command is fraught for many of us. Also given the history of western missions, it is difficult to imagine what Patrick actually did. There are many, many legends about Patrick, that I’m sure you are familiar with them—the shamrock, the snakes, the stick that turned into a tree—and some scant actual records. The broad outlines of his story are known. He lived during the late 4th and early 5th centuries. His missionary arrival in Ireland is said to be 432. These were decades of tremendous upheaval in the Roman Empire…tribes from northern and eastern Europe and Asia were invading, and the Empire was shifting its center of gravity from eastward, and many things were in flux. Patrick was probably born to an aristocratic Christian family in Roman occupied Britain (England). He was captured by Celtic pirates and enslaved in Ireland for six years. He escaped and may have gone to the Continent, to study in monasteries there, then back to England, where he was ordained a priest. He had a vision of a man from Ireland coming to him and appealing to him, “holy servant boy, come and walk among us,” which he did. Many of the legends paint him as a solitary, martial figure, contesting with druids, and kings, overthrowing idols; but more likely, he arrived in Ireland with an “‘apostolic team,’ of priests, seminarians, lay men and women,” [Hunter, The Celtic Way of Evangelism p. 3], and together with these stalwarts he began his missionary work. Once Christianity became the official religion of the Roman Empire, the great commission—to “go and make disciples of all nations” —was interpreted to mean “Christianize and civilize.” The only question being, which comes first? Do you have to civilize people in order to evangelize them? Or do you simply force Christianity on them and trust that this knowledge will increase a desire for civilization? Western history is haunted by the souls of indigenous peoples around the world who have been forced into slavery, their lands stolen, their languages rooted out and destroyed all in the name of civilizing and evangelizing. The Romans believed that some civilizing had to come first (meaning, you had to learn Latin, adopt Roman customs—be like them in order to be civilized and believe in their God). But by the fourth century, the Roman church had given up trying to evangelize anyone outside the Roman world. They were too busy hanging on to what they had, and Patrick’s mission was probably widely regarded as impossible. And if Patrick had followed a standard Roman, Imperial model, it may have been impossible. If he had gone in teaching Latin, establishing churches that did things the Roman way, and generally tried to make the Irish “just like the Romans,” it would have failed. But this is not what Patrick did. He and his team would arrive in a settlement, and Patrick would engage the local leaders, seeking permission to camp, and probing for leaders who might be open to the Christian message. The rest of his team would spread out—meet people, talk with them, help them do daily chores, and look for people who might be receptive. They would, pray for the sick, for the possessed; they would counsel, and mediate conflicts, they would engage in local story-telling, songs, plays, etc. They would go with locals to visit relatives and friends. One scholar estimates that the team would spend months ministering, training, and building up a group of leaders within the tribe. If a critical mass gathered, they would start talking about planting a church, and the local leaders would be placed in charge. A couple of people from team would stay to help manage things, and a couple people from the settlement would join the team to go to the next settlement.where the process would begin again. In this way, it’s estimated that perhaps almost a third of all the clans in Ireland became Christian in Patrick’s lifetime. Which is impressive, but not even close to what his real impact was. His real impact was even greater because this method of moving into a territory, living with and learning from the locals, working with them, training them, creating an indigenous leadership and an indigenous form of Christianity (that still remained orthodox), was adopted by Columba when he went to Scotland in the 6th century, and by Aidan, who went to England in the 7th century. 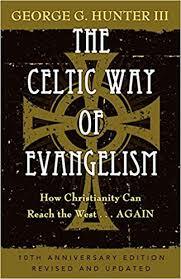 In other words, this Celtic model of evangelism was a powerful force that effectively Christianized and re-Christianized a lot of northern Europe in the early medieval period, without imposing a foreign, “civilizing” layer on top of it. The Empire struck back in the mid 7th century, and reasserted Latin rites, and Latin customs onto the the Church in the British Isles. Subsequent centuries saw a grinding return to the Imperial mode of evangelization where civilization and Christianity once again became two sides of the same imperial coin. Most mainline denominations today still behave this way. Still hold to this Imperial model, where believing comes before belonging. Where people are presented with the Christian message, invited to make a decision to believe, and if the answer is “yes,” then they are brought into the church. The presumption being that one must have a certain level of knowledge and sophistication (be civilized) in order to believe and therefore belong. I often wonder about the famous Episcopal anxiety around the “e-word” (evangelism). What makes us so nervous? Is it the fear that if we dare to share our faith we’ll be seen as trying to convert people in that imperial mode? Or is it more the fear that if we were to really follow Patrick’s lead (or really Jesus’s for that matter), we might have to give up too much of what we hold dear? What if, instead of hearing the Great Commission as “go and make everyone believe what you believe, and act the way you act” what if instead we heard it as Patrick must have, as an invitation to: “Go to the people. Live among them. Learn from them. Love them. Start with what they know. And Build on what they have.” [Hunter, p. 129. This quote is often misattributed to Laozi, I have not been able to find the original quote]. And trust that Jesus will be with us, and that God will do the rest. Amen.